CINCINNATI -- While their fellow incoming college students enjoyed Freshman Welcome Week, Natalie Vasu and Kiley Hatfield spent much of their first week at the University of Cincinnati sitting inside at Turner Schneider Hall. Their new dorm room had a broken shower head, broken locks and a thermostat on the fritz, and at least one person needed to be around to greet the repair teams who came to fix them. Those issues were irritating but all had quick solutions, Vasu said. 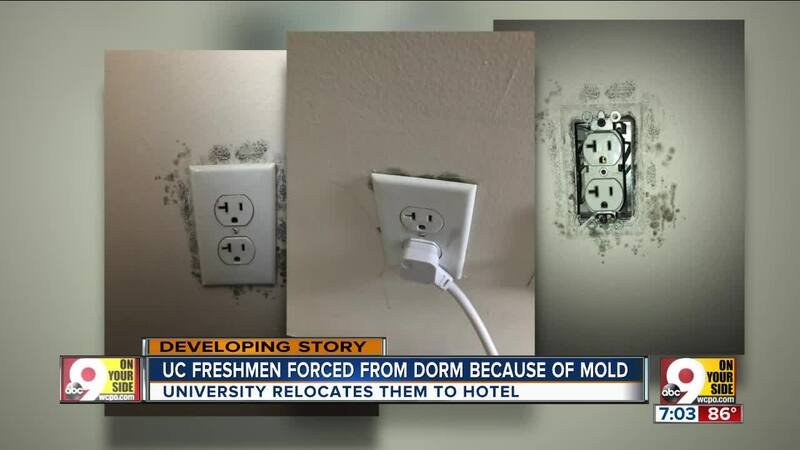 The mold they discovered near four outlets in the room didn't. "There were water dripping stains down the outlet," Vasu said. "We're lucky when we went and plugged things in that nothing caught fire or went wrong." The university immediately removed the girls -- Vasu, Hatfield and their two roommates -- from their room and offered them new rooms. Separate ones. Hatfield said she and Vasu were determined to stay together, and after hours of begging, the university agreed to put them up in a hotel as a pair. It's still a short-term fix. The girls don't know what their long-term living situation might be. "We don't have a permanent option," Hatfield said. "We have no idea where we're supposed to go." M.B. Reilly, the university's director of public relations, said staff have worked to quickly address all of the issues Hatfield and Vasu raised. The malfunctioning thermostat was replaced within days; the broken shower head was replaced the same Saturday morning they reported it. They will continue to work with the pair to find an acceptable place for them to live. "In support of our students, university staff will personally be reviewing alternative UC housing options with them and their parents shortly," Reilly said in a statement. She added no other students in their building had experienced comparable issues.